a Clackity Clack Thing and a Noseflute! will talk about for quite a while. tales, Mike blends stories and music to make a great show. This program works best for the 8 and under crowd. Preschool is more than possible. songs and stories without Hugo. of $$ from a local business or have the kids bring the $$ themselves. hot glue gun and a competent glue-gun operator for this. Fee: $4 per kid. and discuss your needs. He can usually work within your budget. Two show locations may split a day and save both some $$$. other without violating too many traffic laws. Ready for Mike to come to your town? 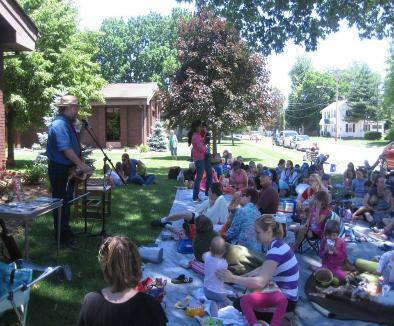 Kids’ Music: not a kid’s class, utilizing Mountain Dulcimer, guitar, banjo, etc. integration of music and/or storytelling into the classroom.